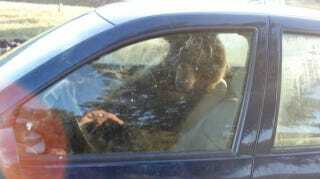 As if it's not bad enough to come outside and find a bear sitting shotgun in your Volkswagen Jetta, to then find out the bear spent his time defecating in your Jetta really is the crap icing on the cake. "I live on a ranch where there are lots of bears...there was one that learned how to open open door handles. It got in and the wind must have shut the door, it got into 3 other peoples cars before getting shut in mine. it drank 4 beers, ate a bottle of mallox, and crapped all over the place."